Arthur Letts, proprietor of The Broadway, was so impressed by his young protege that he put Bullock in charge of a new venture Down the street, one that would attract a more up-market clientele. Bullock called this new store Bullocks and, when it opened in 1907, the focus was not merely on high-end goods but extremely personalized service. As a finishing touch, he filled the store with fresh violets on opening day. And every year after, celebrating its anniversary, he sent his best clients, the ones with a personal account, fresh violets. There were soon a thousand or more of L.A.’s wealthiest receiving violets once a year. But there was a problem, too. 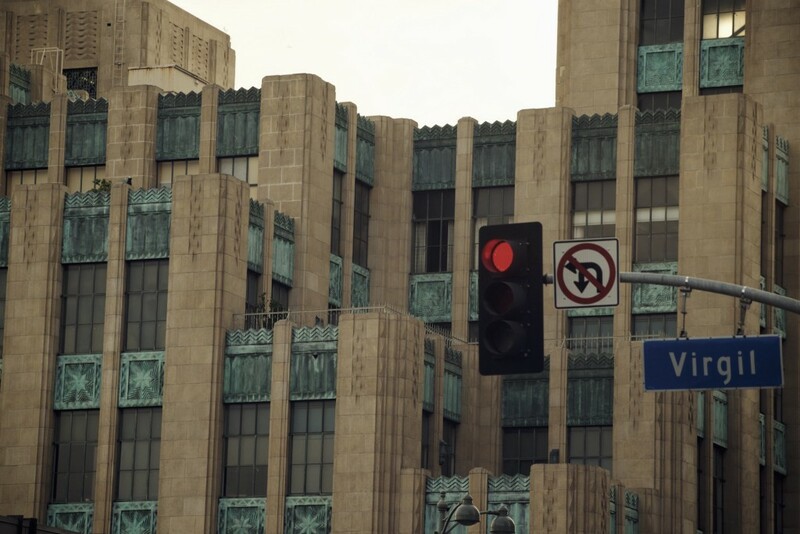 The city was growing, moving westward toward the sea, and the rich were buying up land and building grand estates out along Wilshire Boulevard, then driving Downtown to shop. Why not follow them? Why not build for them? Why not construct a department store unlike any the world had seen? A shopping palace in the suburbs with a vast parking lot in front. That’s the main thing to realize about how next-level fancy Bullocks was when it opened, and even today: The building has its back to the boulevard. It’s more a proto-mall than a department store, but it’s also more palace-like than a mall: five stories of buff-hued terra cotta and copper spandrels, lorded over by a 10-story tower that got around the height restrictions by claiming to be an advertising billboard, then topped by a verdigris-coated spire. At night mercury-vapor beacons from floodlights lit up the hollow tower, casting a violet hue. Violet: the color of the rich. Didn’t matter that it opened on September 26, 1929, less than a month before the stock market crashed. One hundred thousand visitors came in that first week, and the week after, and still, even at the height of the depression, the wealthiest held Bullocks aloft. 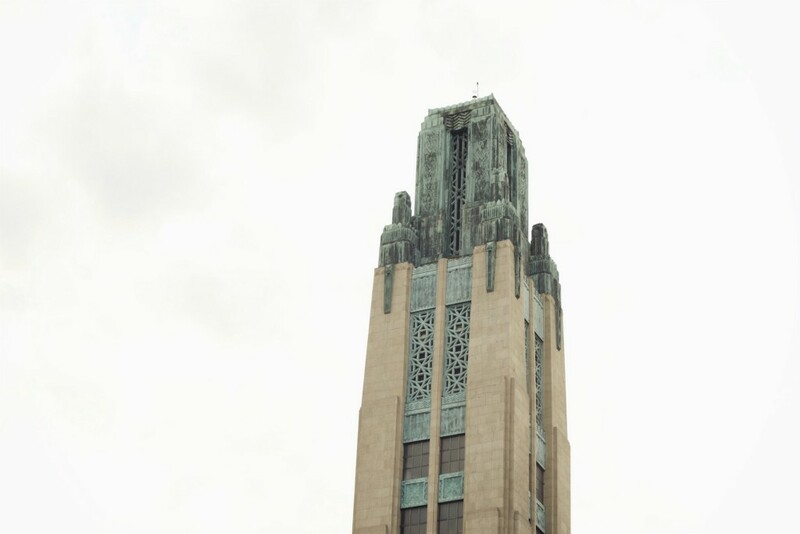 Cathedral of commerce,” it was called. One that ushered in a new era of suburban shopping. The fantasy began before you were even inside: The ceiling of the carport — or, sorry, porte cochere — featured a mural titled “Spirit of Transportation,” a fresco by the artist Herman Sachs that, in art deco glory, highlighted trains and boats and blimps and, yes, the automobile. Mae West, when she came to Bullocks Wilshire, never entered the building but sat in her limousine, smoking, staring up at the mural or at nothing at all, waiting for attendants to bring her something she might be interested in looking at and owning. The central hall was the perfumery — travertine floors, St. Genevieve marble — that led to a series of salons, specialty departments and boutiques: for furs, horses, dogs, formalwear, nightwear, leisurewear (the first in the West; when Garbo visited she wore nothing but a trench coat to make trying on bathing suits easier, which of course caused a scandal, which of course was the point), plus a barbershop, for the children, and a toy department, and above it all, for select husbands of the most expansive private accounts, the wood paneled confines of Mr. Bullock’s own office suit, where they could sit and sip Scotch and smoke and have interesting items of clothing and otherwise brought to them, like Mae in her limo downstairs. The specialty of Bullocks Wilshire was its singular variety — every floor had its own color palette, every room its own theme. There were 30 different wall clocks, each specially designed but all linked and synched via a series of pneumatic tubes. If this item of clothing or room or wall clock wasn’t working for you, wasn’t to your taste, try around the corner. Sit and stay a while. Stay all day. Most everyone did, charmed because, as Bullock had known since the days of pennies as change, the devil in retail was all in the details. 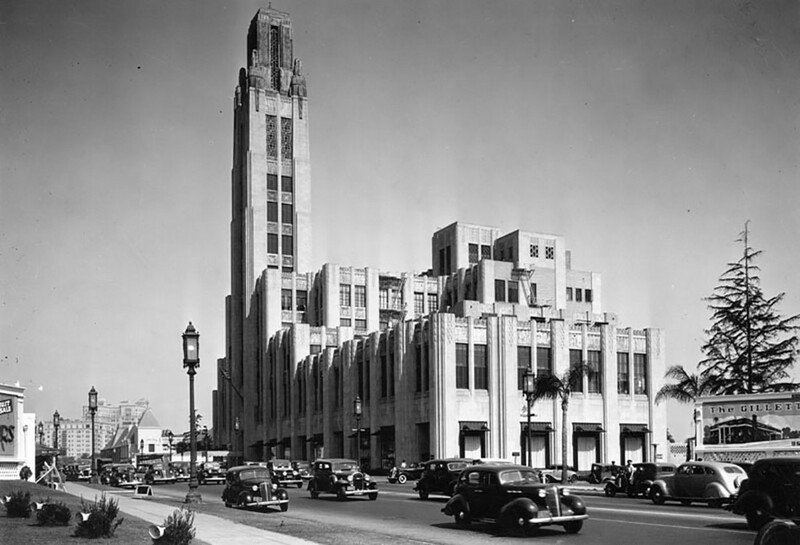 “Every detail, from drinking fountain to clock, ventilator grille, mirror hinge, has been creatively evoked from the future and not from the past,” wrote Pauline G. Schindler in California Arts and Architecture soon after the Bullocks on Wilshire opened. On the fifth floor, all soft desert tones gave way to a latticework of cactuses and a mosaic of deep greens surrounding a water fountain sunk into the wall. For a long, long time the water fountain was gone, hidden behind another wall. So was the nickel, brass, and gunmetal on the elevators, the vermillion floor tiles on in the saddle shop, the deep red oak wall cases, the wallpaper in the Louis XVI Room… all covered up to make way for the changing department store, now chockablock with merchandise, low-ceilinged and aggressively lit, rather than luminous cases highlighting select items, with even more particular goods hidden out of sight, saved for select clients. They were tearing up the department stores and even malls long before the quake finished the job. Tearing the roofs off, letting the sunlight in. It was a neat trick, turning these customer traps into something that gave off the appearance of being sort of open to the world, or at least the sky. What couldn’t be fixed was how people arrived. There was still the parking lot, and the malls still turned the backs to the surrounding streets and faced inward. But Bullocks had become Southwestern Law School, which had painstakingly torn off the acoustic tiles and false walls to reveal the majesty beneath it, and gone about finding and matching the 125 unique shades of paint, restoring the murals, uncovering the water fountain. The fifth floor Tea Room, all desert pinks and a favorite of John Wayne, had been a student cafeteria. The world had become too big for Bullocks. Or—no—the shoppers got too small. What’s Really Dripping on You When You Get Dripped On by an Air Conditioner?